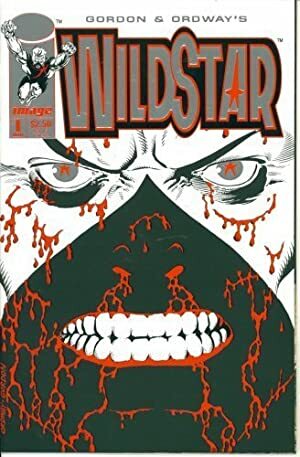 WildStar was a relatively early character during the Image Comics launch, appearing in 1993. He was Al Gordon’s brainchild. Wildstar had two mini-series, plus the usual array of promotional appearances in other Image books, back when this still had a unified super-hero universe. 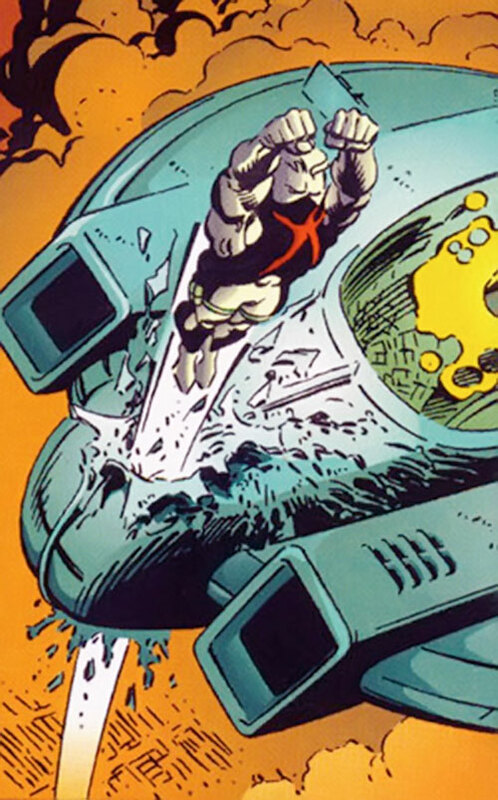 And he stuck around for a bit by making guest appearances in Savage Dragon. Real Name: Michael “Micky” Gabriel. Known Relatives: Brandon Gabriel (father). Height: 5’11″ Weight: Variable Age: Around 20. This Wildstar write-up represents his young, inexperienced self. In the 30 coming years he will gain tremendous amounts of experience and will be much more powerful than in the current form. Wildstar has superhuman strength (about “Class 40”), durability and endurance as provided by his symbiote star. 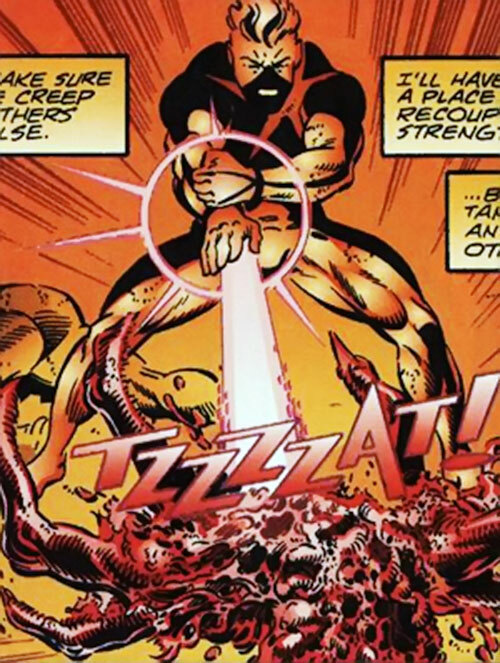 By focusing his will he can release energy through his arms in the form of a powerful force blast or even detonation. This, however, leaves him exhausted. He has some mediocre skills in science, and knows basic combat skills. These will greatly develop over the years. The source of all of Wildstar’s powers is the red, star shaped symbiote located on his chest. It feeds off his negative, more bestial emotions. In exchange it provides him with superhuman abilities. The symbiote controls certain glands, and secretes certain chemicals that influence behavior. As a result, its influence is addictive. In DC Heroes RPG terms, this may result in Irrational Attractions toward using the star. The Star will eventually be bound to Wildstar’s nervous system and internal organs, and then will not be removable without killing Wildstar. Wildstar switches between his civilian and heroic identities by touching the Star with his right palm. It is unclear if none, any or all abilities carry over to his civilian identity. The Star is concerned with Micky’s health. It will attempt to protect him even as Micky is in his civilian form, likely enhancing his durability even then. If the Star detects hostiles or incoming attacks it will force the change into Wildstar’s heroic form. Wildstar has lived most his life in a ravaged future, after a third world war. The Great War had started as the two biggest corporate powers vied for control. An alien race called the Ky’oans had a friendly relationship with the U.S. ever since they crash-landed in New Mexico in 1947. These Ky’oans were looking for something special on Earth. The U.S. Government gave them carte blanche to go about their search. In exchange for the Government looking the other way, the aliens shared technology only dreamt of. Another alien race called the Ra’zplaar later came to Earth looking for that same secret, special something. Their future counterparts had used a stolen time machine to send a beacon back to Earth, to 1993. 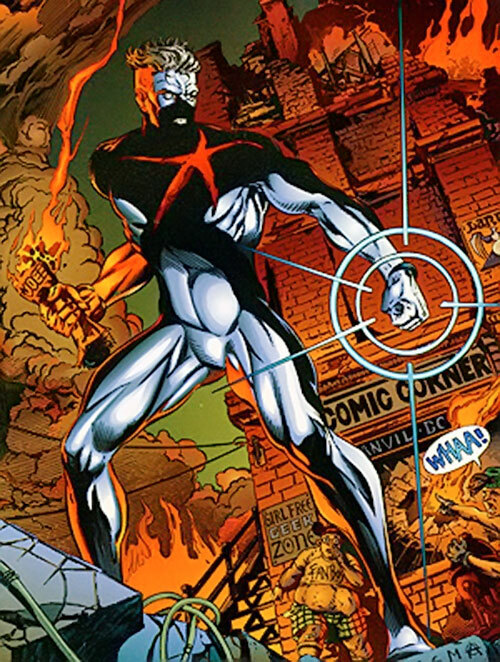 The beacon would alert their historic armada to Earth’s location, so that they could control Earth in a weaker time. The Ra’zplaar made a deal with the U.S.’s biggest competitor. They would supply them with the same level of technology that the U.S. had received from the Ky’oans. It soon got out of hand as each side kept upping the technology ante. The Great War started because of jealousy or greed. The event that started the destruction of the future is referred to as Sky Zero. Circa 2023, an exhausted and hounded Wildstar found a time machine. He used it to escape his Ra’zplaar-aligned pursuers. He hoped to locate the Ra’zplaar beacon in 1993 and to deactivate it before the historic armada arrived to conquer the Earth. Unfortunately, the pursuing enemies were transported along Wildstar. However, the time machine does not really travel in time. Rather, it switches place in time with a copy of itself in another time, together with anyone’s who operates it in those time frames. The area around the time-travel shift is completely devastated, as per a nuclear detonation. In the past, Wildstar lost his opponents and met his younger, non-powered self, Micky, at Sky-Tech headquarters. This resulted in a time loop where he would soon die, but transfer his symbiote and the powers to his younger self. Micky would then go on and do exactly the same things Wildstar had done, including traveling back in time again and again. Just before Wildstar would travel back in time during one such loop, the goddess Skylark appeared. She informed him about the existence of a time loop. Thus Wildstar was able to try to break the loop of actions. Micky left Wildstar to recuperate before continuing with his mission. He refused to believe Wildstar’s story. Upon returning to Sky-Tech, Micky was almost killed by the pursuers, who wanted the beacon to go off as planned. Not only did they immediately recognize him, but they were communicating with the base leader, Micky’s father, and a military general, General Roark. Roark had moved the information about the beacon that everyone was looking for to a top-secret research compound, named New Blue. Before things got out of hand a recovered Wildstar arrived at the military base and took on the pursuers. Wildstar stopped the pursuers, took Micky and left to find the New Blue compound. Wildstar was uncertain whether it was better to leave his past self. So he brought Micky along to protect him. They were confronted by the military on their way. 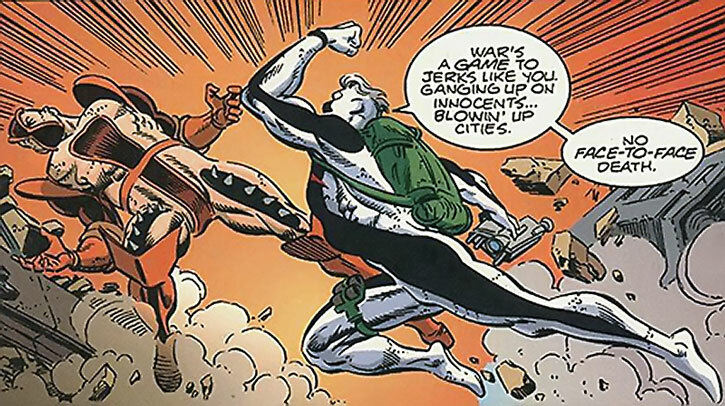 To complicate things, the Savage Dragon showed up. One of the pursuers, Jumpstart, had been left behind by the others. They did not trust her. Jumpstart did appear to have a crush on Wildstar. She claimed to have been trying to protect him for many years. In the chaos that ensued everybody was fighting everybody. Suddenly, Micky was severely hurt, having spinal damage. Wildstar jumped in to carry him away to safety, aided by Jumpstart. Micky was supposed to obtain the symbiote star of Wildstar later. But now history had changed. Wildstar had no choice but give him his symbiote – or he’d die in both the past and the future. Ripping off his symbiote star, Wildstar died, and the star climbed onto the chest of Micky, thus healing him. The future Wildstar’s body disintegrated. However, this meant that there was now a new timeline , where Micky wasn’t necessarily doomed to live the future’s Wildstar dark and dismal existence. Micky, now with the symbiote star, and Jumpstart left to stop the beacon from activating and thus prevent a horrible future. Soon they were ambushed by one of the pursuers, and Micky turned for the first time into a young Wildstar. The new Wildstar and Jumpstart then had to combat all the pursuers. Eventually they crashed into the New Blue compound. An experimental monster joined the fray. Meanwhile, one of the pursuers, Hotwire, hacked the computer network and found useful information. Around the same time the beacon at this base disintegrated. As Wildstar was about to loose to the pursuers the goddess Skylark appeared again. She teleported away Wildstar and Jumpstart (and Hotwire as would later be shown) from the compound. She took the rest of the pursuers to different locations on the planet where they could do no harm. Skylark informed them that it was all her fault. She was from the far future, ahead from Wildstar’s future time. The special something that the aliens would be looking for was her presence. To third world war had been to distract mankind from the aliens’ search. To fix the coming catastrophe, Skylark had arranged for everyone to be sent back in time. The “time machine” had been bogus. Everyone had been transported by her power alone. One of the pursuers, namely Hotwire, had been working with Skylark all along to prevent the war. He had used the hacked information to warn the Ky’oans of the imminent invasion by the Ra’zplaar. This might give Earth time to prepare, and hopefully evade the war completely. Skylark was exiled to Earth by her superiors for having broken some rules of interference. The final outcome was unclear; all of this sounds more complex than it really was. Searching for his purpose in life, Wildstar moved to Savage Dragon’s Chicago, where many super powered beings reside. He temporarily joined a group of freaks living in the underground along Skylark and Jumpstart, and then continued their travels. 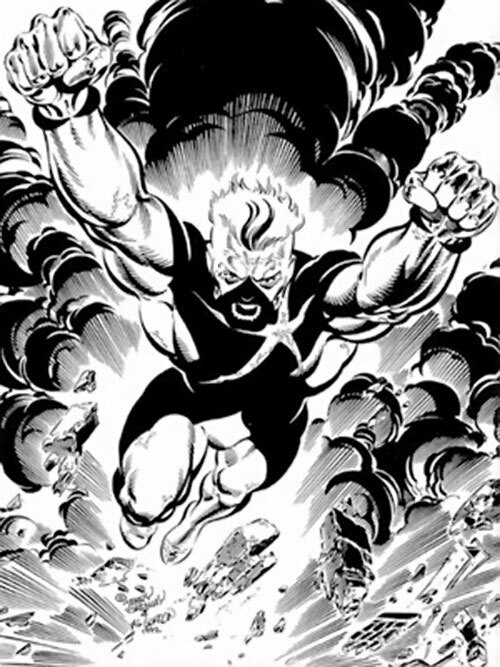 Wildstar is an athletic male wearing a costume in black and white, covering his full body. There is a red star (the Symbiote Star) stuck to his chest. His hair is black with a white streak in the middle. Being in combat often, as well as sweating blood, he is also often somewhat bloody. This makes for a grim appearance. The young Wildstar is a decent kid and searches for his purpose in life. Without his powers he would be a pretty mediocre man. However, he has come to the realization that he needs to grow in character due to having powers. As such he has befriended two other seekers and metahumans, Skylark and Hotwire. Wildstar is something of a worry wart. Thus, he seeks to avoid trouble whenever possible. Due to the time travel paradoxes Wildstar sometimes does get odd and disturbing visions of a dystopian future that could come to pass. The veteran Wildstar believed that a good soldier never lets his emotions make decisions for him. Having a survival and soldier mentality he was not above killing greater threats, although he would still risk his life to protect the innocent. Energy Blast is Fatiguing (-1) and has Serious power burnout (-2). Adrenaline Surge is only usable with STR, Energy Blast, and later Bomb once he gets the power. Familiarity (Physics), Insta-change, Life Support (possibly No need to drink or eat), Lightning Reflexes, Pet (K’l Vann Symbiote Star). Skylark & Hotwire (High), US Army (Low). 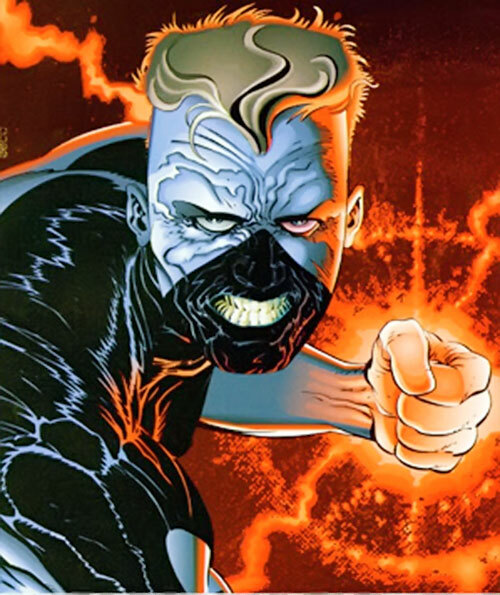 Uncertainty, Loss Vulnerability (All powers are lost, Physical Attributes decreased and he returns to his civilian identity if the Symbiote Star on his chest is ever removed; removal is also likely to kill him), Misc. Wildstar is actually sweating blood (0 pts), Secret Identity. “Two-bit gizmo ? I’ve never heard a temporal displacement device being called that before. You’re stalling, Deadstar ! You know exactly what a time machine can do !” — The old Wildstar then left for the past to change history. In the coming years, the young Wildstar will loose his Uncertainty Drawback. As an adventurer, a soldier and a fighter he will improve greatly. Future Wildstar is over 50 years old. His Martial Arts will increase to 09 APs, his DEX to 09 APs, his STR to 13 APs, his BODY to 10 APs, his Scientist to 06 APs, and his HP total to 65 HPs. He will also have a Gadgetry skill of 05 APs. His MIND and SPIRIT scores will increase to impressive 07 APs, while his INFL, WILL and AURA will be 05, 05 and 06 APs, respectively. He will have learnt even more about energy control, being capable of great bursts of energy release, although this will tax him fast. In game terms, he will thus also have the additional power of Bomb 15, but with the Limitations: Bomb is Fatiguing (-1), has Catastrophic power burnout (-3) and is Minor Marginal (-1). His Adrenaline Surge power will have increased to 12 APs. Total Initiative will thus be 23. Sometime in the future, he will also loose and replace his right leg with a cybernetic leg. The leg is assumed to have the same Physical stats as himself. In the future, his identity will be a Public Identity. By Dr. Peter S Piispanen. 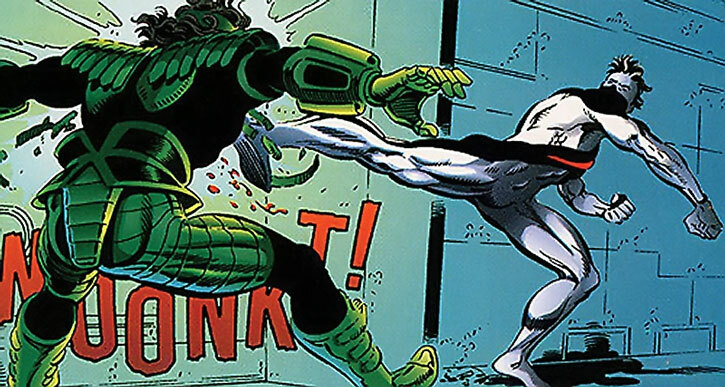 Source of Character: Wildstar: Sky Zero (Gordon & Ordway) and The Savage Dragon books, Image.